See that over on the right? 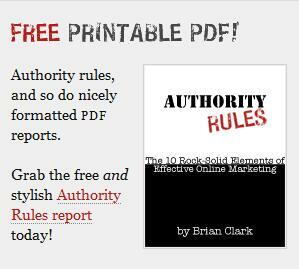 That’s Brian Clark’s new report on authority. It’s called Authority Rules. You should read it. Authority is a funny thing because it’s something all of us want, but only a few us truly know how to obtain. Brian’s report helps the rest of us finally get a damn clue so we stop making asses out of yourself on the Web. In Authority Rules, you’ll learn the power of authority, why Google values it, how to cash in and the 10 rules for building an authoritative Web site. Do yourself a favor and go check it out. You have the choice of reading it on the site or downloading it as a PDF to sleep with under your pillow. Whichever method you choose, I think you’ll find it’s pretty essential reading on the topic. And that’s all I have to say about that. Thanks for giving the rest of us a light, Brian.